Our research strategy defines how we chose our projects and how we can make the biggest difference for children with cancer. Cancer treatments for children are aggressive and for over 20% of children not effective. As a parent of a child with cancer you have no choice but to accept the harsh treatments that form the backbone of today’s therapies; surgery, cytotoxic chemotherapy and radiotherapy. While newer therapeutic options are slowly being introduced the frontline treatments for children have not changed. Some charities state that childhood cancer is a success story. For us nothing could be further from the truth. We admit that the percentage of children surviving 5 years cancer free has gone up to almost 80% but what are the long term prospects for these children? Cytotoxic chemotherapy and radiotherapy leave a legacy of issues for children meaning they have to face a future full of uncertainty. There are still some childhood cancers where there is no cure and many more where relapse means a terminal prognosis. We think this is unacceptable and the only way forward is the earliest introduction of drugs targeted at a tumour’s biological characteristics. These new drugs do not have the same horrendous side effects of today’s treatments. The only problem is to get them to children who need them at the earliest opportunity usually through a clinical trial. Drugs are first tested on adults and then after successful clinical trials are tested in the laboratory on childhood cancer tumour cells and tumour models. This ‘pre-clinical’ testing is vital in order to produce the evidence that a new drug has a therapeutic effect on a childhood cancer. Following this pre-clinical stage the drug can be taken into the clinic to be trialled in children who are the best candidates based on a child’s tumour biology. 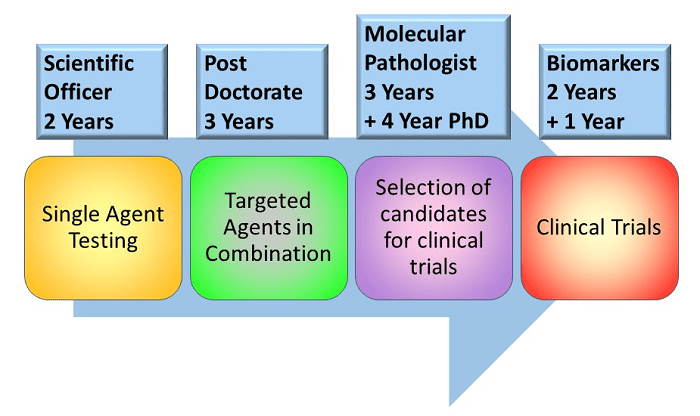 Our research objective is to introduce personalised medicine for children with cancer. The stages are shown below. 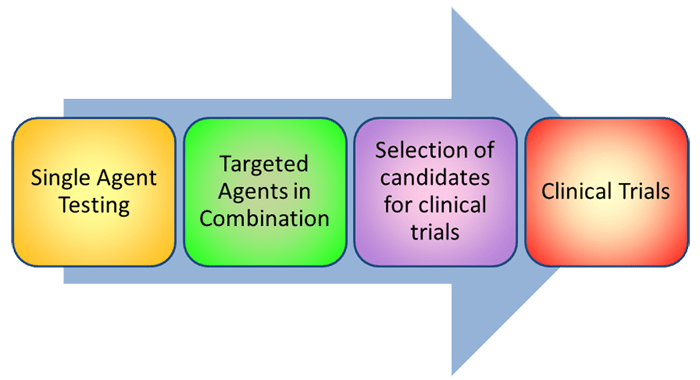 Unlike drug development projects where access to the latest agents is at the discretion of the drug manufacturers, the latest DNA sequencing technologies are readily available.